At the polar opposite ends of the earth lie two unique, yet both quite cold, regions: the Arctic North and the Antarctic South. 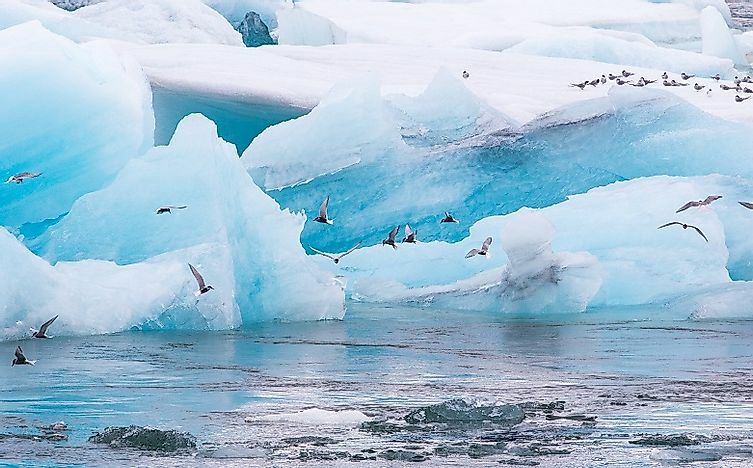 Arctic Terns, pictured above flying about a coastal glacier, are unique in the avian world for annually migrating betwixt and between the earth's two Poles. The North and South Poles are geographically, and literally, polar opposites. What we mean by that pun is that, while the Arctic and Antarctic are very similar in that they’re largely cold and frozen year round, a closer look at these two polar regions of our earth reveals some remarkably drastic differences, even in the harshness of their respective environments. The Arctic Ocean is the smallest and shallowest of the five oceans, with an approximate area of 5.247 million square miles. It is surrounded by Eurasia, North America, and Greenland, and the north pole is located about 450 miles from the nearest land, Greenland’s far north Peary Land. Antarctica on the other hand, is the fifth largest continent at about 5.4 million square miles (or slightly larger than the Arctic Ocean) while also being the coldest, driest, and having the highest average elevation of any continent on Earth. The South Pole is located in what is known as East Antarctica, about 800 miles from the ocean's edge of the Ross Ice Shelf on the Pacific side of the continent. While permanent multi-year ice covers only about 28% of the Arctic, permanent ice covers 98% of Antarctica. While both polar lands are frozen and share the same general basic climates, they differ somewhat in the technicalities of those climates. The Arctic is on average about 65 degrees Fahrenheit warmer than the Antarctic, and while the Arctic’s ice cap averages between only a few inches and about six feet in thickness, Antarctica’s ice cap is over 15,000 feet at its thickest point over East Antarctica, and almost never does the temperature climb above freezing on the entire continent due to the entire landmass being surrounded by what is called the “Circumpolar Current”, which blocks warmer air from reaching the South Pole region. While people were hazily aware of a frozen over sea in the extreme north as early as the late Antiquities, when in around 325 BC Pytheas sailed north in search of tin and was stopped by ice floats, Antarctica was not discovered until 1820 by Russian sailors Fabian Gottlieb von Bellinghausen and Mikhail Lazarev on the Vostok and Mirny when they spotted the Fimbol Ice Shelf. Though highly disputed, it is claimed that American Robert Peary was the first to reach the North Pole on his conquest of the pole on April 6, 1909, however, there is evidence that his and his party’s navigational work was sloppy, and thus he did not actually reach the pole. The first people to have officially walked on the North Pole were Alexander Kuznetsov and his Soviet party in 1948 after landing their plane nearby and walking the rest of the way. On the other hand, the South Pole was reached by Roald Amundsen, a Norwegian who had previously become the person to successfully sail through the Northwest Passage, the possible elusive trade route to the Far East, originally hoping to conquer the North Pole, until hearing about Peary that is, and immediately set his sights on Antarctica. However, he had a rival to the South Pole who was British Naval Officer Robert Falcon Scott. Amundsen was the first to reach the pole, on December 14, 1911, beating Scott by 34 days, and Scott and his party died while on their return trip due to bad weather and being ill-prepared for the journey. Research stations have been established all around the polar regions, with all of the stations in the arctic located along the coastlines of islands and continents (so there is no station on the actual North Pole), while in Antarctica most of the 70 research stations are located on the coast, but the two best known being located in the interior of the continent. Namely, these are the Scott-Amundsen Station near the South Pole, and the Vostok Station, which records the lowest temperatures experienced on Earth. Historically, Antarctica was neglected for economic prospects from being so inhospitable. Currently, the Madrid Protocol renders the entire continent and surrounding waters off-limits to resource extraction. The Arctic however, has been inhabited by the Inuit, Eskimo, and many other tribes who hunt the wildlife up their as to support their livelihood. And more recently, the shrinking sea ice has led to increased potential for oil drilling in the arctic. Arguably the most stark contrast between the two poles are the wildlife. The North Pole is dominated by polar bears, muskox, arctic hare, caribou, snowy owl, arctic fox, ermines, arctic cod, wolves, seals, walruses, and several species of birds and whales. The Antarctic, by contrast, has several best known species of its own, including penguins, blue and killer whales, seals, albatrosses, and squids. Interestingly enough, the Arctic Tern is the only bird that migrates nearly 25,000 miles between the poles, with breeding grounds the North Pole and then wintering on the Antarctic coast. Recently, researchers at the Vostok Station drilled down through the ice to Lake Vostok, a sub-glacial lake 13,000 feet beneath the surface of the ice, and there is evidence there may be microbial life flourishing in the lake. The environmental threats in the arctic are many, ranging from resource exploitation between competing nations to the seemingly most pressing issue of climate change. The Arctic is especially susceptible to climate change partly from the fact that on average it already sits around just freezing and is located on open water which does hold some warmth beneath the ice, while at the same time surrounded by land and is heavily influenced by those climates around it. And because of the shrinking ice there, and there’s no treaty banning resource exploitation, disputes between countries and who gets drilling/mining rights has been mounting, with environmental coalitions stepping in as moderators. Antarctica, while also bearing the brunt of climate change, isn’t being affected as drastically since its ice is located on land surrounded by water, which is the main reason to why the South Pole is colder than the north. West Antarctica has been more of a greater concern in recent decades. Animals in the Antarctic that stayed out of the cold waters, such as the crabs, may take to preying on animals that have defense against them. On top of that, there remains the large hole in the Ozone over Antarctica. But at least on Antarctica there’s the Antarctic Treaty and Madrid Protocol which keeps all states present down in peaceful relationships with one another. What and Where Is The Antarctic Desert?